Another guest post today, this time Mike is bringing his Week 2 DFS advice our way! I hope everyone had a profitable first week of DFS. If you read last week’s play/fade column and took a few of my recommendations, hopefully it worked out well! I know that nobody likes to hear about anyone else’s fantasy teams, but, as promised, I’ll briefly recap my week, and look at one Fanduel cash lineup and my Draftkings Millionaire Maker entry. Here was my primary cash lineup, this one from the Fanduel BIG Double-Up (I highly recommend playing the large field double-ups weekly). This lineup, including a couple that were slightly different, was successful in 10 of 13 entries. One of my losses unfortunately was to fellow FF Librarian writer Jen Ryan! This one had some hits and misses, but ultimately was enough to beat half the field and cash. 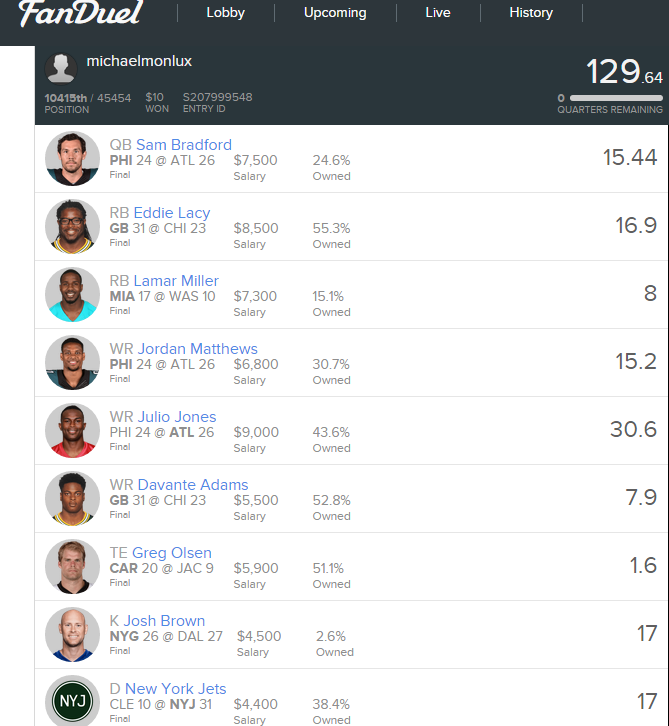 The goal on Fanduel cash games is generally to get to 120 points. Hits: Lacy and Julio were must-plays this week as I mentioned in my column, and both were a success (and highly owned). The Jets defense was a no-brainer as well. Misses: I was very high on Lamar Miller this week, but he didn’t pan out as hoped. Despite my write up on Tyler Eifert, I went with Greg Olsen here as the safer play, and he was a massive bust. The fact that he was 51% owned meant it didn’t hurt me too badly though. 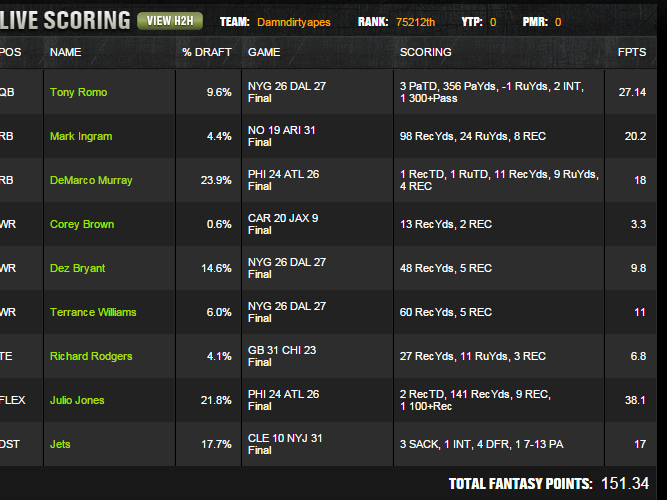 Even though this lineup didn’t work out as hoped, it was good enough for a minimum cash, so I’m not too disappointed. This tournament payout is so top heavy that everything has to come together just right to have a chance to win. I liked Tony Romo this week, and he played well (and in fact was on the roster that won $2 million! ), but my hopes for all the catches and touchdowns to go to Terrence Williams and Dez Bryant were dashed, as Jason Witten scored 2 TD’s. I faded Lacy only due to the fact that he would likely be the most highly-owned RB, and pivoted to DeMarco Murray instead. Mark Ingram was underpriced and a great value (especially with C.J. Spiller out), and I figured correctly that he would have a low ownership percentage. I wasn’t thrilled about playing Corey (Philly) Brown or Richard Rodgers, but both were minimum-priced and in starting roles, and I was trying to find a way to squeeze both Julio and Dez into my lineup. Bradford was a popular play last week, and should be again this week, as his pricing is outside of the top 10 QB’s, but he has top-3 upside. He threw 52 passes last week, and although I’m a little worried about the Cowboys trying to play keep-away and taking the air out of the ball, Bradford should have a similar amount of attempts this week in a game with the highest over/under of the week. The Falcons are a small underdog in the game with the second highest over/under for the week. He should have a healthy number of attempts once again, and of course he has the luxury of throwing to Julio Jones. This one could come back to bite me, as Brees may be the most popular play of the week, especially for anyone who watched the Bucs get destroyed by Marcus Mariota and the Titans last week. My biggest issues are game script and price.The matchup is good, and Brees always plays better at home, but I see the Saints establishing Mark Ingram and their running game this week. Brees doesn’t have the weapons at WR and TE that he once did, and at his price point, I’d rather play Andrew Luck for a bit more, or Matt Ryan for a bit less. I don’t know how much of a “fade” this is, as I don’t think many will be looking to Newton this week. The Texans were lit up by Alex Smith last week, but I believe that was an anomaly, and the Panthers passing game is anemic at best. Newton always has potential to wreak havoc in the running game, but the Texans will keep him under wraps. Hyde made some DFS players some serious money last week with his monster game versus the Vikings. He looked really good, and it appears that he is the centerpiece of the Niners’ offense. I could see a scenario where the 49ers fall behind and have to throw more this week against the dynamic offense of the Steelers, but at this price point I think Hyde is a very safe play with obviously huge upside. Reggie Bush was injured last week, and if he is out this week, it makes the Hyde play even more attractive. I suggested Miller last week, and he was a bit of a disappointment. I’m rolling with him again this week against the Jaguars. The Dolphins always seem to forget about their running game, but they made an effort to get Miller the ball more in the second half last week, with decent results. I expect them to make a concerted effort to get Miller going this week, and they should be playing with a lead. Last week’s must-play won’t be on my radar this week. Lacy is never a terrible option, but going against the defense of Seattle, I’ll take Matt Forte or DeMarco Murray at that price point, or save some salary by using Hyde, Miller, or Ingram. I don’t hate this play as a contrarian tournament option, because I think the Cowboys will try to take the air out of the ball with their running game, but I think a stout Eagles run defense and the game script will cause them to have to abandon it. Add to that the fact that Randle is part of a three-headed RB committee and and I just don’t think he’s a good play this week. I’d rather have Tevin Coleman, Doug Martin, or Ameer Abdullah at this price point. I see the Jets having to play from behind and throw the ball in this game. Lockdown corner Vontae Davis will be on Brandon Marshall, so Ryan Fitzpatrick will look to Decker more often than normal. Decker only had two catches last week (one for a TD), but I could see him grabbing 5-6 this week, and hopefully another TD. Matthews caught 10 balls last week, and the other receivers for Philly looked awful. While the Eagles would prefer to spread the ball around, right now Matthews appears to be the WR who will be eating up all the targets. His price should eventually escalate to a higher level, so I’m using him at this price while I can, especially on FD. Allen was a monster last week, but I’m not chasing last week’s points here. While I could see Allen being productive again, the Chargers generally spread the ball out a bit more, and last week might end up being Allen’s top game all season. Price-wise he’s crept up to Calvin Johnson/A.J. Green/DeAndre Hopkins territory, and I’m not ready to pay for him at that point quite yet. A popular pre-season pick in re-draft and MFL10 leagues, Johnson looked awful last week. If you’re tempted to play him if TY Hilton is out this week, go down to Donte Moncrief at a lower salary, and I’d even consider Phillip Dorsett for tournaments. There are a multitude of more attractive options at his price point. Johnson appears to be a possession receiver at best at this point in his career. To Gronk or not to Gronk? That is the question this week. I almost always start all my lineups with Rob Gronkowski penciled in at TE, but with several great, far less expensive options this week, it’s a bit of a dilemma. I’m recommending Reed this week if you aren’t going with Gronk. Reed had 11 targets last week, and I’d expect a similar amount this week. I’m picking Reed over Eifert this week primarily because he’s less expensive and Eifert will likely be heavily owned. To be clear, I’m not basing this fade entirely on Olsen’s poor outing last week. I still think he’ll have some great weeks this season, perhaps even this week. It’s just that there are so many excellent options at TE this week, I can’t see much value to paying the price for Olsen, even though it went down this week. Good luck this week. Find me on Twitter @mikemonlux, or leave a comment in the comments section if you have any feedback as far as what information you’d like to see from this column going forward.